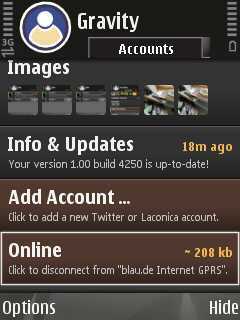 Gravity v1.00 is the first fully-featured and native Twitter client for the S60 platform. 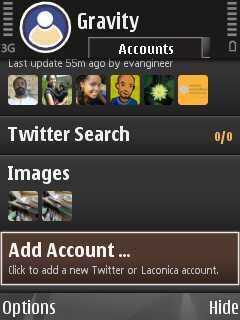 It supports multiple accounts, Twitter Search, Laconica, TwitPic and wraps everything into a gorgeous looking interface. The only downside to this software is that it may create too much traffic whereas the alternative – Twibble (which I’d also used since its first day as a public release) – seems to generate less traffic. I’m on a 1GB flat for my phone, which means I can generate 1GB in traffic via the phone and only pay 9,90 EUR / month. I actually don’t need 1GB at the moment because we also have DSL here, but it makes sense if you happen to download more than 41 MB / month (9,90€ / 0,24€/MB = 41,25 MB) + it isn’t limited to a proxy server, special online pages or other crazy limitations. And DSL sometimes fails, so it’s a good fall back option. 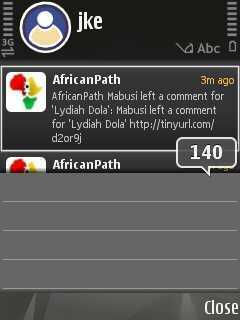 The beautiful part is that you can really SCROLL between tweets like you would do on an iPhone – bila the touchscreen on my N95 though..
And another good part is that it’s now much easier to insert images on your tweets (Twibble also has this but isn’t as comfy to use). Gravity comes with a 10day demo version and I instantly (!) registered it after using it for only 2 minutes. Now, you’d have to know for yourself if you’re willing to cough up ~ 10,- € (in Germany – sijui why they are adding VAT on shareit.com for other countries) for an otherwise free and time consuming service such as Twitter, but then, again, there are other – much more useless – applications for the iPhone ppl are willing to spend money on and also: there are only a few really good applications for Symbian devices. Gravity is one of them. You’ll also need to access the download page for the registered version via a normal computer as the phone’s internal S60 browser is having problems identifying the .sisx format. Jan, the developer behind Gravity, also mentioned that he’ll be working on some bugfixes now, so maybe there’s a way to include this as well (refers to the purchase of the software directly from a phone. Update routines are just flawless!). 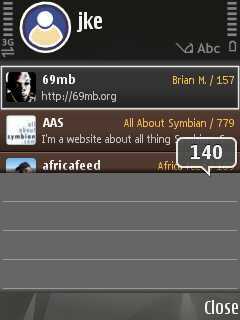 Verdict: If you’ve been on Twibble before, you’ll LOVE Gravity. Highly recommended application. There should be a cheaper version of Gravity as not everyone out there is able to cough up 9,95 € on a mobile app – and sometimes it’s technical reasons as to why a prog like Gravity is only successful in developed countries: how would you pay for this app from e.g. 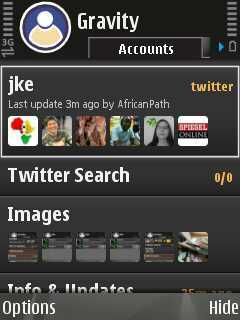 Kenya (where there is money but no payment system such as Paypal?). And how about a sponsored (& localized) version with fixed banners? Would it make sense? And what would ppl be willing to spend on an app (in other countries than Germany)? There should be a mobile WordPress editor that’s just as easy to use as Gravity. After all these years of using WordPress for blogs and mobile phones, I’ve often called for better mobile blog editors and tested quite a few on this blog. Twitter indeed already is some sort of microblogging, BUT! 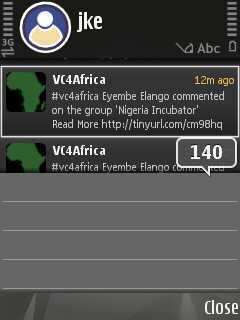 it would be great if there also was an easy-to-use editor tool on the phone which could provide true mobile blogging.